Is Thailand dangerous for girls? According to a group 15 year olds at Bann Nongkhainok School in Ubon Ratchathani – No! Not at all. We recently ran a focus group with a group of fourteen teenage girls to find out about their perceptions of the dangers around them, and their approach to keeping themselves safe. We were a little concerned with the findings. When asked about potential risks to women and girls in Thailand, most girls could only list extreme examples gained from the media, such as a high-profile murder or trafficking case. Since they didn’t think this was likely to happen to them or their families – they didn’t worry about it. When prompted about ‘everyday’ dangers, such as talking to people and posting personal details online, unhealthy relationships, and unwanted pregnancy, the students could not to talk in any detail about possible risks or potential impact on their lives. Their response to dealing with danger was simply to ‘fight and run away’, demonstrating a worryingly incomplete understanding of the complex dangers that they may face over the course of their lives. Looking at the facts, there is reason to be concerned. In Thailand, nearly half of all women experience violence at the hands of their partner. However, fewer than 2 in 10 report it. Those who do, only do so when it reaches the stage that they need urgent medical attention. Sexual harassment in public places is widely acknowledged to be an issue. The dangers of posting personal photos and meeting people online are well reported, especially for teenage girls. Unfortunately, none of the students reported having any prior training in their rights or how the law relates to their lives. 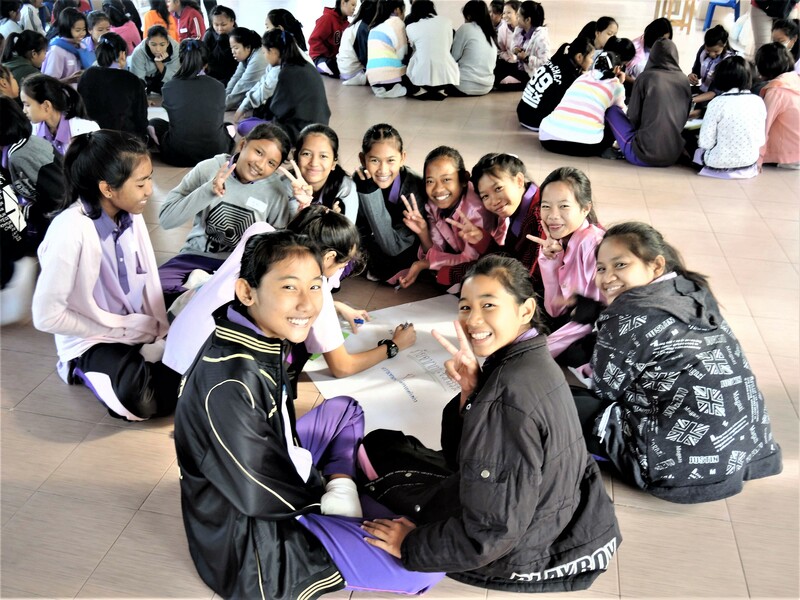 What’s more, given how many of these girls will move from their village to the city of Bangkok upon leaving school, in order to find better paid employment, they need to be aware that Bangkok presents a whole new web of possible dangers. Without savings, these girls will take the first job they can find in the city, which will often be in a domestic home (as a maid, nanny or domestic helper) or in a bar or entertainment venue in one of the city’s nightlife hotspots. These jobs inevitably present more risks from both their employer and their customers than working in an office or a shop. After our focus group, we revised and improved our training workshop – ‘Claim your Rights’ – for delivery in high schools across Ubon Ratchathani and the Bangkok Metropolitan region. Hopefully this will go some of the way towards changing attitudes and developing a fuller understanding of dangers faced by women and girls out in the province.